Debugger Model Overview | Valhalla, I'm coming! Hello there! In this post I will do my best to sum up the new debugger essentials. So let’s get to it! In the old debugger all the actions and UI logic were all together. This makes it difficult to maintain and scale the debugger, and don’t even think of having new debuggers. So the new debugger came up to do some serious cleanup. The intention is to separate the model from the UI, so any UI implementation, let’s say Glamour, Morphic, whatever, can be attached to the model, and use it. 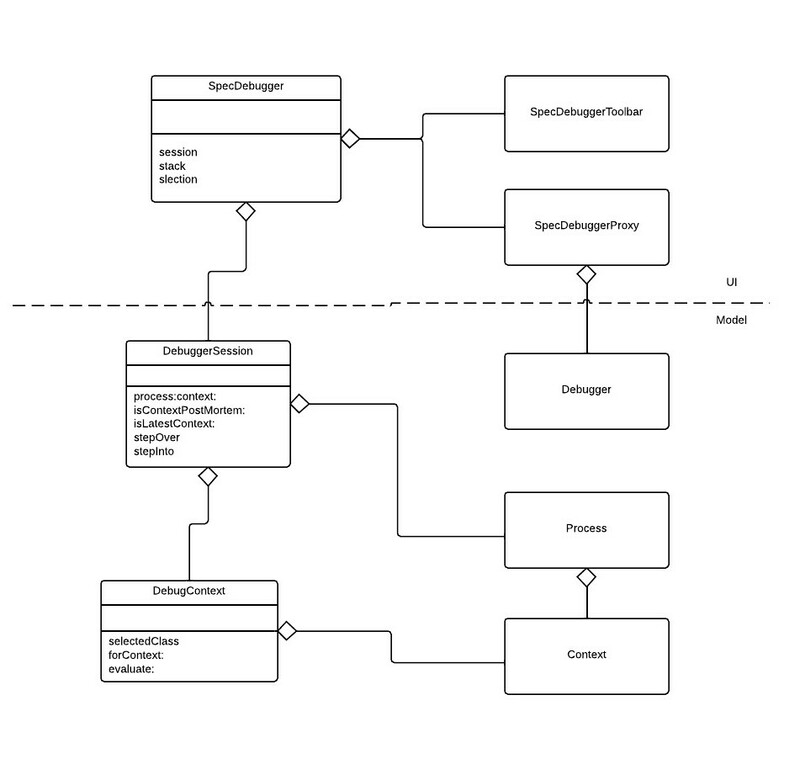 This is, the model does not know of how the stack is represented (a list, a table, a widget) , nor of the existence of the inspector, the selection handling, or the widgets that are being used. The model only knows of processes and contexts. The cool thing of this approach is that now you could take away everything above the dotted line (namely the UI components) and plug in any other implementation you may like. The default is one made in Spec. A DebugSession has all the information of the current debugging process, this includes the interrupted process, the current context, and the possible actions for them. A DebugContext right now just has helper methods to handle contexts. In the future, we should return a stack made of DebugContext, which would have more information (top context, active program counter, for instance) and more intelligence than a plain context. So now you have a new DebugSession, to which you can ask things like #stepOver or #stepInto to move between contexts and the stack. And that’s pretty much it. Stay tuned in!